The School of Computing has a world class usability laboratory. Usability means making products and systems easier to use and matching them more closely to user needs and requirements. Usability testing involves measuring the performance of typical users (ease of use, task time, user satisfaction) on products, systems or websites. 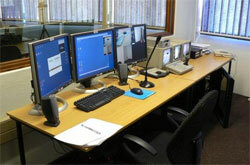 The usability laboratory allows us to support the observation of human-computer interaction. The observer and participant rooms of the laboratory can be seen in the pictures below. The usability laboratory is available for research or for professional usability consulting. The usability laboratory also consists of a Tobii eye tracker. 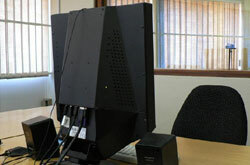 Eye tracking is a technique to determine eye movement and eye fixation patterns of a person. 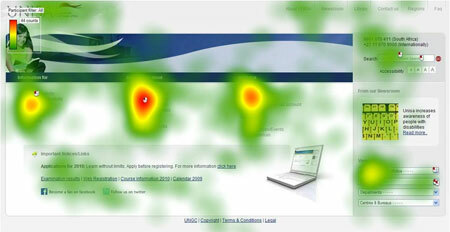 Eye tracking provides further insight into the user's thought process as they completed a task. The example below shows how several participants looked at the UNISA homepage. The red (hot) areas demonstrate where participants fixated the most to find certain information. A specific area of interest is physiological computing. The goal is to transform bioelectrical signals from the human nervous system into real time computer input in order to enhance and enrich the interactive experience (e.g. automatically changing the difficulty of a computer game based on input received). It has many more applications, e.g. online marketing endeavours (measuring exactly what the viewer experiences as opposed to subjective questionnaires), e- and m-learning, in combination with eye-tracking equipment to provide richer data etc.